ELIMINATE YOUR TERMITE & BED BUG PROBLEM & PROTECT AGAINST THEIR RETURN WITH 100% SUCCESS! Have termites, bed bugs, insects, or rodents invaded your home, garage or other structures on your property? If so, they can be more than just annoying, they can be doing severe damage to the structure of your property even as you read this. BUGS R US has been in business more than 20 years servicing the Greater Toronto Area. We are a complete pest control company that specializes in Termites, Bed Bugs, Insects, Rodents and Real Estate Inspections. At BUGS R US, we know what kinds of pests are common in the GTA, and, after 20 years, we have developed both the experience and expertise to deal with them. We will answer all of your questions to reassure you that we can quickly get to the root of the problem. No Yearly Renewal Fees! The competition charges $300+ yearly to inspect your home. Call us now for a Free Inspection and don’t let them spend the winter in your home! Our termite treatments are 100% Guaranteed to permanently solve your termite problems once and for all. We have the industry standard insurance coverage and then some to protect you. We’re a fully licensed pest control company so you can feel confident in our services. Your neighbours don’t have to nor will they know you have a pest or termite problem. We’re the #1 Rated Termite Pest Control Company in the GTA years running! We’ve been around for more than 20 years. Trust in our expereience to help you protect your home. 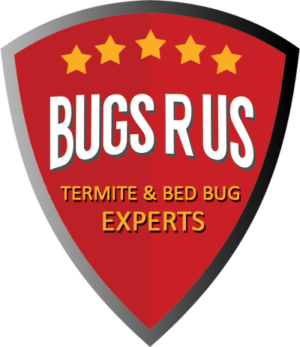 Bugs r Us aims to be at the forefront of environmentally safer and the most effective termite & bed bugs extermination pest control solutions. Years of experience, customer feedback, and record tracking help us to provide our customers with the most reliable treatments, with the lowest impact on the environment. Our termite control treatments are 100% effective, every single time! Damage caused by termites can ruin a house! They live in colonies and never expose themselves to open air and thrive where there is wood to soil contact, (example, your garage) in damp areas like basements and in crawlspaces. We stand behind our work here are Bugs R Us with a 1-YEAR 100% Guarantee on all termite treatments. Are you a real estate agent and worried your clients might be buying a termite infested home? Let us help you protect your client’s future home from the damage of termites today. We can give the home a clean bill of health or eliminate them 100% using Altriset. Guaranteed! Bugs R Us is the only company in Toronto and thed bugs treatments. We’re serious about the work that we do to protect the spread of bed bugs. Treatments are done by the company owner and not outsourced. Bed bugs are small biting insects that can multiply quickly and travel easily. Anyone can have an infestation of bed bugs, regardless of income or housing. Bugs R Us offers a one year guarantee on mice and rat infestation, treatment, control, extermination and removal. We provide a safe, effective treatment regiment for your home and family memebers to permanently deal with the problem permanently. Are you ready to Exterminate Unwanted Pests? Mike was amazing…he guarantees his work for a year and tells you what to do to avoid mice in the future. I have had to call him a few times because of my paranoia and he keeps checking in to make sure that everything is in order and as it should be. I would highly recommend him. When I found fleas inside my home my first thought was for my 3.5 yr old son. I needed the problem taken care of immediately. Thank goodness for Michael at Bugs R Us. He arrived at my home in under 2 hours and canister in hand rid my home of the pests in a single application. The story doesn’t end there tho. To my disgust, some days later I discovered the source of the infestation to be a family of raccoons living under my shed. I called Michael and left a message. He returned, and treated my place in no time. Michael at Bugs R US has been spraying the exterior of my property for more than ten years to prevent carpenter ant infestation. Always a thorough job. His service is highly recommended. We had to ring Mike because our family couldn’t sleep from the scratching noises the mice were making around the house. He arrived quickly, identified the entry points, gave us homework to fix some holes and explained each step along the way. The bait he left was effective and slowly the solution worked. He did have to come back several times to leave more bait and alleviate our panic but with patience (and his 90 day guarantee) we solved it safely and humanely. I had been watching black ants in my house all winter and decided to call Bugs R Us to see if they could help. Michael showed up in an unmarked van, sprayed the house and provided a 90 day guarantee. He did a great job explaining why the ants where there, and how to keep them out in the future. Would not hesitate to recommend. We discovered a carpenter ant problem last summer over our garage, and this summer we discovered that they may have burrowed a new home into our roof! I promptly called Mike from Bugs R Us, and he came right away. He was super professional and told me exactly what the problem was and why the ants liked to keep coming back and he outlined in detail how we can make our home less inviting to bugs and creepy crawlers. My partner and I started hearing some odd noises coming from the floor in the front of our house. Eventually that noise turn into a raccoon fight, screeching and screaming from the floor boards. I have no clue how they got in there but everyday we would hear them. Finally we called Mike from BUGS ARE US on the recommendation from a friend up the street. Mike came and spoke with me, he explained the plan of attack because the mother raccoon had babies things would be a little more complicated. Owner is professional, knowledgable and did a great job in a prompt manner. I would highly recommend this company to someone looking to deal with ants or squirrels. First rate company. Excellent. Altriset is the latest generation of termiticide with the lowest toxicity level of all termiticides. Altriset’s is reported as having no effect on animals, bees or plants and has no odor, fumes, color or taste. It has a transfer effect between termites through grooming and feeding. Altriset is the best termiticide in the world to take care of the Canadian subterranean termite. Your family and neighbors can enjoy a termite free environment with a 1 Year Guarantee and minimal impact on the environment and surrounding areas of your home. At Bugs R Us we get the homeowner involved in the process by inspecting your bait stations monthly, starting in May. You can call us to treat any infested stations which will kill trespassing termite colonies. When there are no termites found in the bait stations this will prove your house is termite free, which eliminates the cost of an expensive yearly renewal program. Call Us For Same Day Service At: 416-396-1515 to eliminate Termites, Residential Bed Bugs & Rodents in The Greater Toronto Area.